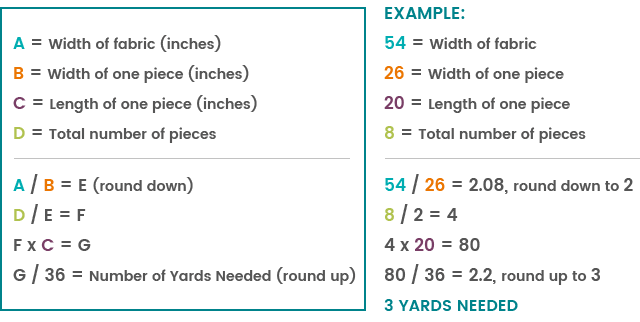 These instructions will show you how to calculate how many yards you need for several different scenarios whether your dimensions are larger or smaller than the width of your desired fabric. These calculations work for many projects, including pillows, cushions, fabric wallpaper, tablecloths, bedding, and headboards. For curtains, we suggest using our drapery yardage calculator. For more complex upholstery projects, see our upholstery charts for yardage estimates. See Measuring Yardage for a Tablecloth for additional information specific to tablecloths. For the rest of the world on the metric system, convert to inches before starting. The easiest way to do this is to google “cm to inches” and enter the centimeters into the conversion calculator. First, you need to know what the total dimensions are in inches. This includes any extra you need to sew, apply, or finish the fabric. If you’re making something that needs a seam allowance, like pillows, you need to add the seam allowance times 2 to the width and length. If you’re making canvas wall art, you need to know the size of the canvas plus how much extra is needed to wrap around the back and staple. If you’re making something that needs to be hemmed, you need to know how much extra you need for the hems. The other thing you need to know is how wide your desired fabric is. Move onto the next steps according to if your total dimensions will fit into the width of the fabric or not. If you just need one piece of fabric and it fits into the width of your fabric, you probably don’t even need to be reading this, but we’ll explain just in case! 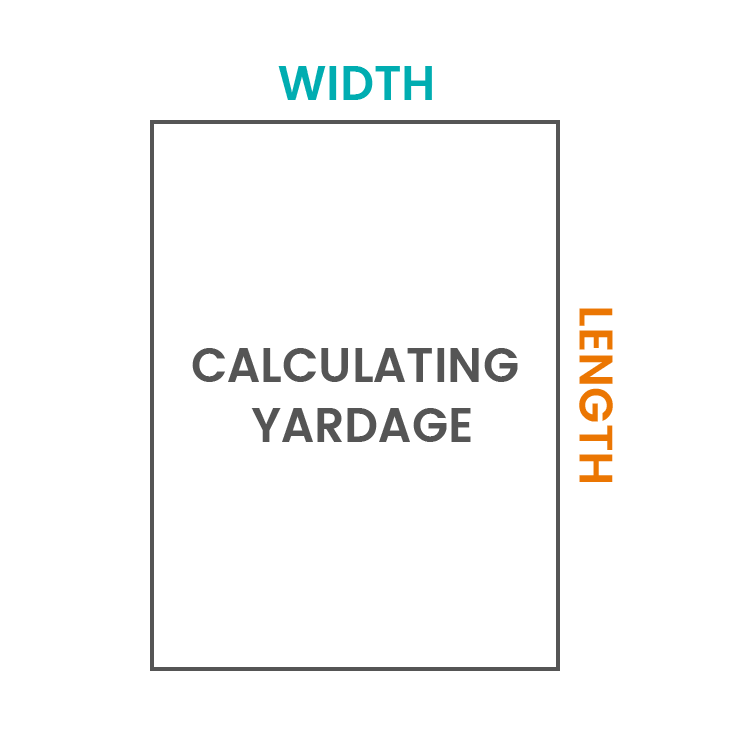 Take the total length you need and divide by 36 to calculate how many yards you need. Most of our fabric is sold in full yard increments, so round up to the nearest yard. If you need multiple pieces that are the same size, like for pillows, napkins, dining room chair upholstery, etc., start with your fabric width and divide by the width of one of the pieces you need. Round down to the nearest whole number. This is how many pieces fit into the width. Next take the total number of pieces and divide by this number to figure out how many rows you will need. Finally take the length of a single piece and multiply that by the number of rows. Divide by 36 and round up to the nearest whole number. If your fabric is solid or not directional, you can try flipping the width and length to see that needs fewer yards. In the example, once rounded up, it is also 3 yards. If you need multiple sizes, it helps to draw it out. When the width of the piece is wider than the width of the fabric, you’ll need to sew or join pieces together. These calculations work for many projects, including fabric wallpaper and other wall coverings, tablecloths, bedding, ground and floor coverings, awnings, banners, backdrops, headboards, and panels. Start with your desired total width and divide by the width of the fabric. Round up to the next whole number. This is how many widths of fabric you need. Then take the total desired length and multiply by the number of widths you just calculated. Divide by 36 and round up to the next whole number. This is the total yardage you need. If you need multiple pieces that are the same size, before dividing by 36, multiply by the number you need, then divide by 36 and round up. Or if they’re different sizes, add them up before dividing by 36. If you have a patterned fabric and want to match up the design, before dividing by 36, add one vertical repeat per every extra width of fabric. For example, if you need 3 widths of fabric to get the correct total width, add 2 times the vertical repeat to the total length before dividing by 36. If the length is less than the vertical repeat, just use the vertical repeat as the length and you don’t have to add extra before converting to yards. You can find the repeats in the details section on the product page for our fabrics. Most of the time you don’t have to worry about the horizontal repeat because the pattern will divide evenly into the width of the fabric. This means the pattern will match up at the selvages with a slight overlap so no fabric is wasted. Some projects, like duvets, tablecloth, and headboards, look best if you have the full width piece in the middle and the remainder on the sides. This looks more professional than having a seam right down the middle. To find out how to sew patterned fabric together, look at How To Make a Duvet Cover. These instructions are good for rectangular pieces and can be used with other shapes if you measure the dimensions at the largest width and length. Some projects can be too complicated and you may have to estimate. It’s better to end up with too much than to come up short! Find the fabric for your project here! I have chairs that are 21”x24”, 22”x24”, and 24”x24”, 54” solid fabric. How many yards for each? BEST ANSWER: The largest dimension of your chair is 24 inches. You can get two chair covers from 24 inches of 54 inch fabric (54 divided by 24 gives you 2.25). Depending on the number of chairs with 24 inches as the widest width will tell you how much into that 54 inch fabric you will need. If you just have the three chairs you list in sizes, you should be able to get all three chairs covers for about 1 and 1/3 yards with no room for mistakes. Also, you must remember to allow for if the fabric has patterns or designs. How many yards of 54" wide fabric for a pillow sized 12" x 18" with a horizontal repeat of 26"? BEST ANSWER: For one pillow, you need one yard. Would like to make bed spread, measurements are 113 wide x 108 lenght.how many yards do I need ? BEST ANSWER: What's the width of the fabric? I need to know how much fabric i will need to put in between squares of a quilt . The squares are 14 by 14 they are 5 squares across and 6 squares down? BEST ANSWER: You need to multiply the width of 5 squares across the width of squares down to get the overall size of quilt and then purchase that amount of batting. For example 14 inches times 5 equals 70 inches. Are you going to have sashing or borders you will need to add this to your total width as well as total length to get an accurate overall size of quilt top. For example, say you want to add a 2 inch sashing between blocks and a four inch border around the outside of your top. You would add 6 + 8 inches to the calculated with your blocks for an accurate width of whole quilt top. Do the same for the overall length of quilt top then make sure to buy batting larger than your calculations. how many yards of fabric to make a slipcover for a slipper chair? How many yards of fabric will it take to cover a reclaimer ? How many yards of 58 inch wide fabric to make a queen size blanket? BEST ANSWER: You would need 5.5 to 6 yards per side. How fabric in yards to make a 8x10 fur rug? How many yards for a tree skirt to be 62 inches in diameter? I have a quilt that measures 104”x 107” the backing is 108” wide how many yards of material will I need please? I want to make a baby blanket material is a yard and 1/2" but I want it smaller how do I cut it to make a square? How many yards to cover an 83 x 32” couch cushion and 3 26x8” back pillows? How many yards of fabric for 33” by 28” tablecloth? How many yards of 45” fabric or cover an ottoman this is 37”x37x16.5”? I have 30 squares of fabric 14 x 14 square inches each I need to know how many yards of stabilizer i will need? I have a wall 7ft high 11.4 wide my fabric is 110inches wide I have 7 yards now question is how many panels can I stuff into this space?